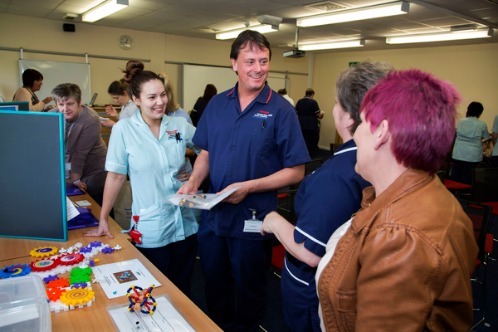 ​Friday 2nd October saw more than 50 stalls showcasing the tremendous work this Trust is doing collectively to help find smarter ways of working to improve patient care. There were displays showing what we’re doing with volunteers, new techniques in interventional radiography, the work being done to reduce length of stay and improve rehabilitation in stroke patients by the Early Supported Discharge Team and a lot of the education and training courses laid on by the team in the Education Centre to ensure our staff are kept abreast of the most up to date techniques and practices. 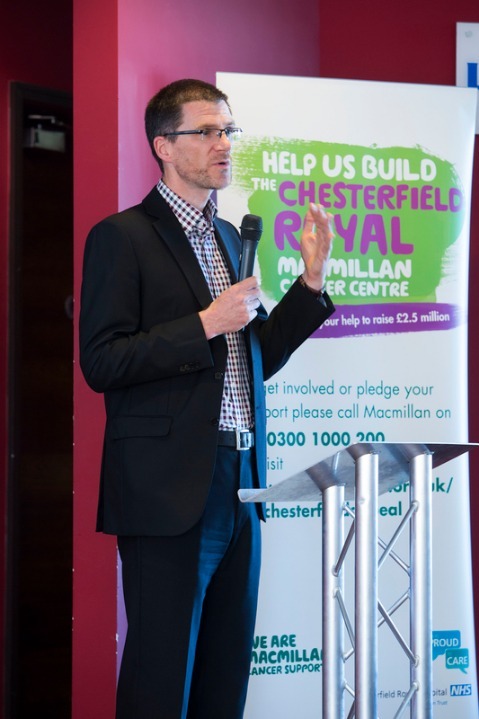 ​was also more detail about our partnership with Macmillan Cancer Support in raising £2.5million for the upcoming Chesterfield Royal Macmillan Cancer centre. There was also support from many of our other charitable friends including Headstrong, Ashgate Hospice, Nenna Kind, the Book Stall that raises money for us in the main entrance every Wednesday, raising awareness of eating disorders and much more. Our Chief Executive Gavin Boyle gave a rousing speech, speaking of his admiration for the work that has gone into streamlining our services and improving patient care. It’s been a real effort with all departments and divisions pulling together and inspiring each other with new ideas that can be applied to different areas and this is one of the reasons for holding an event like this. It can inspire other people to think ‘we can do this in our department’ and spread good practice across the Trust. 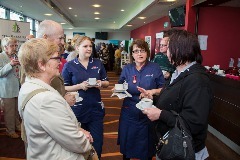 This is the third time we’ve held the event and around 700 people took part and came to see what was happening. You can take a look at the pictures in our Celebrating Our Success gallery to get a flavour of the atmosphere by clicking here. 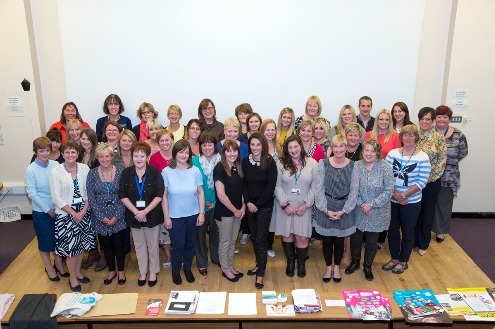 ​After fourteen years at the Royal we bid an emotional farewell to our School Health Team. On 1st October 2015 the service transfers to Derbyshire Community Healthcare Service (DCHS) as part of a re-tendering process. At this point the service has more than 50 staff, including a number of specialist positions playing a key role in promoting the health and well being of school age children. 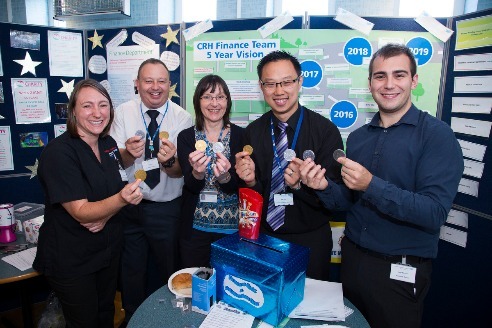 In 2013 the Chief Executive awarded them the Team STARS award, an incredible achievement for a group of staff who work within the community setting. ​The move to DCHS will see School Nurses, School Health Assistants and the majority of the School Health Admin team becoming a 0-19 integrated service, working alongside Health Visitors and nursery nurses to meet the health needs of children, young people and their families. ​It’s been a difficult decision and there have been some tough times over the last twelve months but it is hoped that, in the long term, the children and young people of Derbyshire will continue to receive the excellent service the team already provides. 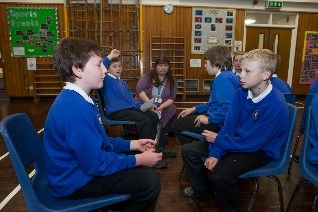 School nursing has been around since the 1800s and was first introduced to treat minor injuries at school, give health education, follow up care and help keep youngsters healthy enough to attend school. Much of the core ideas behind those early days remain but as society changed, so have the challenges facing school nurses and what defines children’s health. ​Carmel Stagles is the Head of Nursing for Child Health, she said: “I’, immensely proud of the job they have done over the years and they’ve touched countless lives. I come from an education where school nursing didn’t exist the way it does now and the work they have done has changed me in a meaningful way; I’m a better nurse and person for it. ​“When they met for their final team meeting I was asked to say a few words and I thought the words from a traditional Irish Blessing were very fitting. It goes ‘May the road rise to meet you; May the wind always be at your back; May the sun shine warm upon your face; And the rains fall soft upon your fields; And until we meet again; May God hold you in the palm of His hand’. 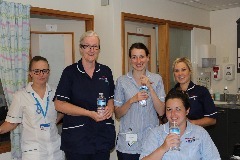 As temperatures topped 100 Degrees Fahrenheit on Wednesday 1st July the Trust was keen to emphasise to colleagues that it is not only fine to grab a drink of water but encouraged! 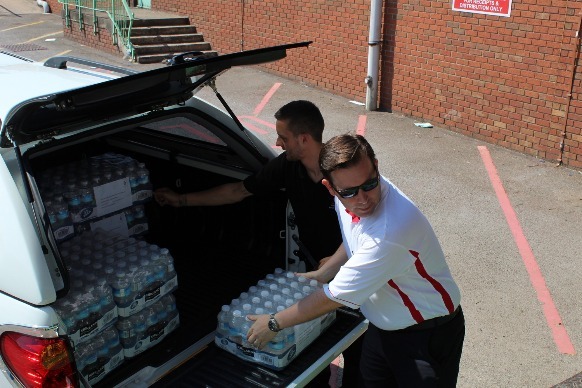 Hydration is fast becoming a hot topic within the NHS and a big thank you must go to Gilder Mitsubishi for donating a total of 3,800 bottles of water to the Trust, that worked out at more than one per staff member! It's vital that we keep out patients hydrated in such incredible heat and it's equally important that you practice what we preach and make sure you keep yourselves topped up with the wet stuff. With more hot weather to come, the message is to make sure you drink plenty of water and look out for the signs of dehydration . Sainsbury's Chesterfield have given our stroke patients a massive boost by helping give our stroke unit an impressive makeover. The Unit's Activity Co-Ordinator Lindsay Millward mentioned to the supermarket that they needed some compost for a project to cheer up the garden and they went more than one better than that. 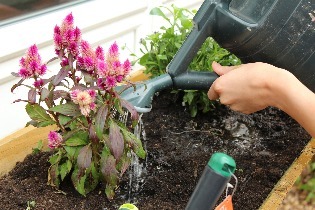 The store donated a number of plants, hanging baskets, paint. solar lights and much more to bring a touch of colour to the garden. And when they did fall slightly short (they'd run out of bedding plants) B&Q donated some more to make the garden complete. 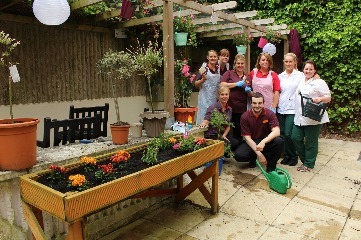 A number of their staff then came to the garden to help staff and patients transform it into a summer haven! Lindsay said: "It's wonderful, we needed to give it a bit of life because we'd not had much of chance to get out there due to it being a cold May. We like to take the patients out there because it takes them away from a clinical environment, gives them a touch of normality and allows them to do something practical that they might also do at home. Lindsay (right) helping to unload Sainsbury's very generous donation. "It's a great form of rehabilitation and we get a great response from the patients, including the ones who perhaps don't respond quite as well within a more clinical environment. 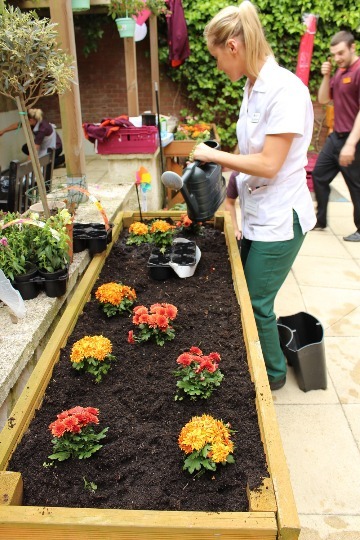 It's fun and more natural and doesn't feel like rehab to our patients, especially in an environment as colourful and relaxing as this." 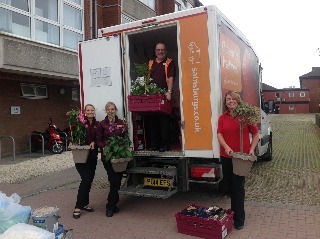 Kerry Hardy is the PR Ambassador for Sainsbury's Chesterfield, she said: "We have a community budget to spend on things like this and when Lindsay came to us for a bit of help we thought we could do a lot better than compost. We're always keen to get involved with projects like this and we're also going to help out with a Garden Party that Lindsay has planned for July so I'm delighted we've got the place done before then." 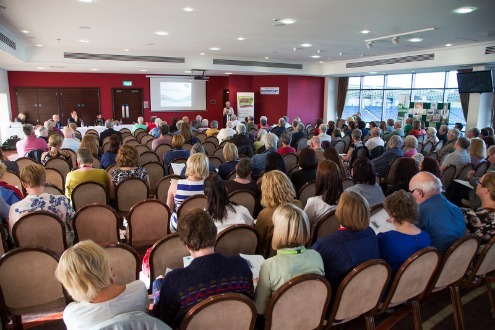 The Trust held another of its highly successful membership evenings on May 12th. 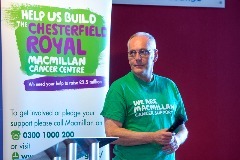 On this occasion it was held off site at The Proact Stadium to accommodate the larger numbers expected as we unveiled plans for the Chesterfield Royal Macmillan Cancer Centre. The £8.9million development will bring all of our cancer services under one roof and we will be receiving the substantial help of Macmillan Cancer Support as they embark on an 18 month, £2.5million fundraising campaign. Dr Roger Start (pictured left opening proceedings)is the Lead Cancer Clinician, he said: “Around 15 to 20 percent of everything we do, including outpatient appointments, diagnostic tests, pathology, treatment, surgery and aftercare is related to cancer. It is a core service for this trust. “We make more than 1,500 new diagnoses of malignancy or cancer every year. At any time we probably have another 9,000 patients who are already in the system undergoing treatment, follow up or have moved into survivorship. The numbers are quite substantial and they are growing so it’s clear that we needed to do something. 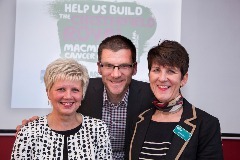 ​Macmillan has committed to raising more than a quarter of the total cost of the build and has already launched its fundraising campaign. There will be a number of activities, initiatives and fundraising opportunities taking place throughout the 18 month campaign. There will be regular updates on these pages throughout the development of the centre, including news on the build, significant events and fundraising opportunities so please stay tuned. If you would like to donate directly to the Macmillan appeal then please click here and you can leave your donation today. ​Tree Planting gets Cancer Centre underway! ​Work has officially started on the Chesterfield Royal Macmillan Cancer Centre and we’re already starting to see the benefits! Around 20 trees were felled in March, just behind the Pathology labs, to make way for the centre, work on which is due to begin in Autumn 2015. The trees were removed ahead of nesting season to avoid the risk of disturbing local wildlife and ensure the area is clear for when work commences. 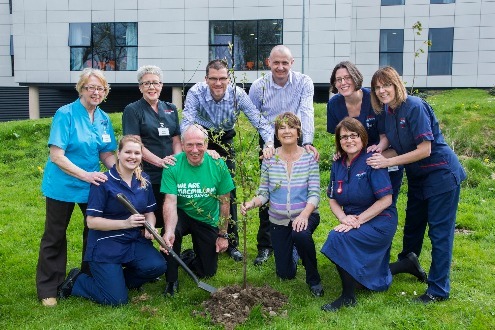 To offset the carbon footprint, the Trust took delivery of 30 young trees, a mixture of Ash, Yew, Hollies and some fruit trees, that were very kindly donated by Derbyshire Community Health Service and planted behind the new wards, next to the relaxation garden. ​Lee Fox is the Trust’s Electrical projects Manager and part of the project team for the development of the centre, he said: “I would like to thank all of the DCHS team for the excellent work they do at this trust, for the donation of the Trees and for the tree planting exercise for the Cancer Centre Project. A very special visitor came to the Eye Centre to recognise a partnership offering practical, emotional and social support to people who are losing their sight. Sight Support Derbyshire is a registered charity that has been operating for more than 100 years and recently signed a new contract to offer Eye Centre patients a drop in facility to get further advice and support about their condition. 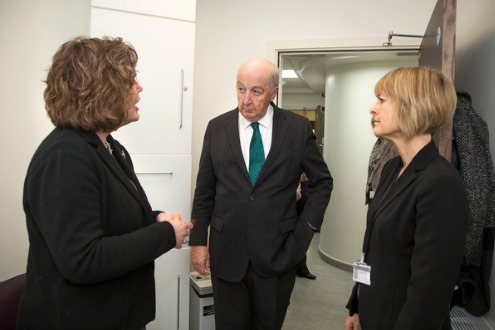 On Monday 16th March The Duke of Devonshire, a patron of the service, was given a tour of the centre to find out more about the service and how it sits within the Trust’s Ophthalmology department. Angela Jones is one of the Eye Clinic Liaison Officers (ECLOs), she said: “We see a lot of the patients who come from the Eye Centre, referred by the consultant or nurse but we will also go to inpatient wards within the wider Trust. A lot of the work we do outside of the Eye Centre will be related to occupational therapy and goes a long way towards helping to prevent falls. In 2014 Sight Support Derbyshire’s ECLOs were in contact with 2,639 people seeking information and dealt with 401 referrals. People referred to the charity were put in touch with services such as Low Vision Assessment, home support, rehabilitation, and social groups as well as other agencies such as welfare support and social services. Three volunteers work alongside the ECLOs, taking information about the charity’s services to wards and clinics throughout the hospital. 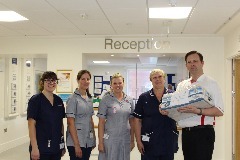 The eye clinic team also works with other departments such as Falls Prevention teams, consultants and GPs to promote its services, and supports SSD volunteers working in eye clinics in Buxton and Whitworth Hospitals. Claire Winfield, the Sight Support Derbyshire’s Chief Executive, said: “It was an absolute pleasure to meet our Patron, the Duke, and tell him about our work at the Eye Clinic. The evidence is that our support can make a huge difference and we’re grateful to the hospital’s charitable trust for recognising this and funding our Eye Clinic Liaison Officers at a time where there is more call for them nationally. “It’s an exciting time for us at the hospital, as we are seeing more patients than ever before and doing more to highlight how we can support people with sight loss. And our services at the hospital are working in tandem with more support across North East Derbyshire thanks to our successful bid to the Big Lottery. The Duke is given an overview of the Eye Centre's photographic department. A service introduced to help stroke patients return home sooner is already yielding impressive results. The Stroke Early Supported Discharge (ESD) team was introduced last October and estimates from the first three months indicate that almost four bed days have been saved for every patient eligible for ESD, in some cases patients returning a fortnight earlier than initially expected. The scheme, using additional funding from the Derbyshire Clinical Commissioning Group, is a service providing specialist rehabilitation and nursing support in the patients’ own home instead of hospital. The ESD helps to relieve some of the pressures on social care and also those experienced on the stroke unit. 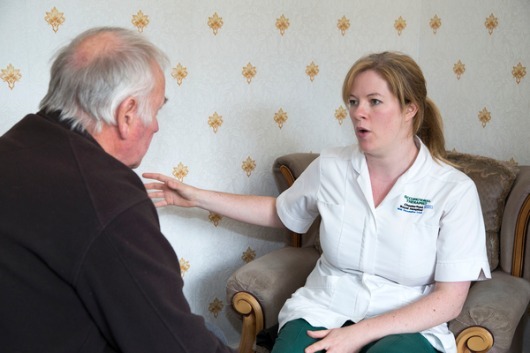 The patient will often see the same therapists that they worked with whilst in hospital, this in turn means a better continuity of care, familiarity and the trust and relationships are carried from hospital to home. This works wonders in aiding the rehabilitation and recovery of stroke patients. Physiotherapist Grace Walton said: “It’s especially useful for complex cases and the patient may be visited multiple times by one or more members of the ESD team. It not only gets a substantial number of our patients home sooner and safely, it also helps reduce readmissions and allows the patient to continue rehabilitation in an environment familiar to them which is an aid to recovery and independence. Around 40% of the patients, that’s close to 200 annually, are admitted to the stroke unit will be eligible for ESD. They will be identified as being medically stable, able to maintain their own safety independently or with the support of people at home. The team includes specialist stroke nurses, a stroke physician, physiotherapists, speech and language therapists and occupational therapists. The team will plan the patient’s discharge from hospital and work with the patients for up to six weeks. 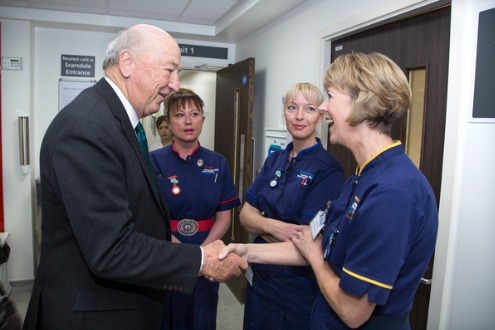 Our wards will all be refurbished with dementia patients in mind as part of a long term, Trust wide plan. 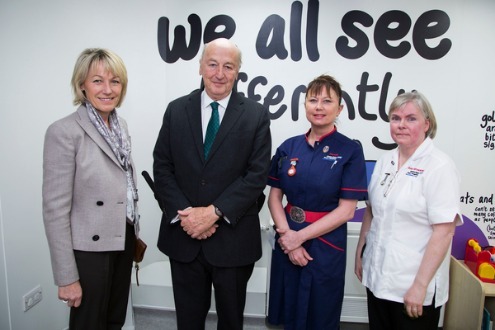 The Trust opened its new Discharge Lounge to patients earlier this year, becoming the first clinical area in the hospital to be designed specifically to help patients with dementia. The lounge features new design aspects, including contrasting colours for toilet doors, coloured borders around bay doors, non-reflective flooring and appropriate signage. Glyn Wildman is the matron for the older person and project lead on dementia services, he said: “The design has been approved as part of all future upgrades so has become the basis for our rolling ward refurbishment programme. The discharge lounge and its design will effectively become the template for all of our wards which will have a uniform look and adhere to the dementia friendly principles which are research based. “At the moment all of our bays are visually indistinguishable from the next, as are our wards. What we’re doing is making our wards easier to navigate for those who have cognitive impairment by making entrances and fixtures bolder with contrasting colours. Colours are more memorable and recognisable for patients with cognitive impairment than a door simply marked ‘Bay 4’. “The flooring will be non-reflective because clean, shiny floors appear slippery to dementia sufferers, dark borders look like a hole or step whilst fixtures and fittings in toilets such as the seat, handles and flush will all be red because contrasting colours help to differentiate between functional and non-functional parts of a room. There will also be visual aids to accompany worded signage. The design has followed advice from the University of Stirling that has carried out a wealth of research through their Dementia Services Development Centre. The Trust has sent a number of key ward staff to the centre for training in dementia care that has been cascaded to other health professionals within the Trust to improve the knowledge of the type of specialist care this group of patients need. 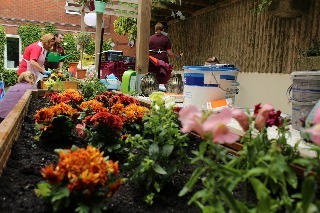 Glyn added: “It’s pleasing to see that our care of dementia patients is being extended to the ward environment. Patients with dementia thrive on familiarity and they are encouraged to make their bed space unique. It perfectly represents what we’re working towards at this Trust in terms of putting the patient at the centre of everything we do. “A lot of work has gone into improving dementia care including reminiscence packs to stimulate memories from their past and create conversation that all wards have access to. We also introduced dementia assessment nurses to help with the early diagnosis of patients who present with certain symptoms or are of a certain age.